CDB/World Bank Consultancy Project Launched to Establish Regional Procurement Training Centre at UTech, Ja. — UTech, Ja. Stakeholders in the Project to establish the Caribbean Development Bank (CDB) and World Bank funded Caribbean Regional Procurement Training Centre at UTech, Jamaica pose for a group photograph following the project launch ceremony held on Monday, April 18, 2016 at the Technology Innovation Centre (TIC), UTech Papine campus. Pictured L-R (front row) are Ms. Geraldine McDonald, Lecturer, College of Business and Management (COBAM), Mrs. Genefa Hibbert, Project Coordinator, UTech, Ja. Enhancement Project, Mr. Douglas Fraser, Head of Procurement, CDB, Dr. Carlys Cadogan, Lecturer, College of Business and Management, (COBAM) Dr. Paul Golding, Dean, COBAM, Mr. Nigel Cooper, Lecturer, COBAM, Mrs. Dennise Haldane, Director of Procurement, UTech, Ja. 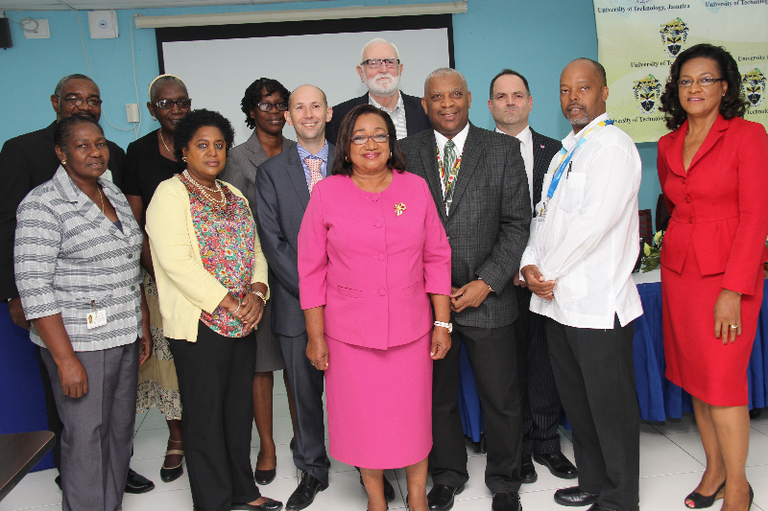 Second row (from left), Mr. Lloyd Wint, Lecturer, COBAM, Ms. Yvette Richards, Lecturer, COBAM, Miss Rosalee Sawyers, Lecturer, COBAM and consultants Messrs. John Brooks and Scott Smith of BiP Solutions Limited. The University of Technology, Jamaica (UTech, Ja.) has been awarded a contract by the Caribbean Development Bank (CDB) and the World Bank to undertake a feasibility study for the establishment of a Caribbean Regional Procurement Training Centre at its Papine campus. The contract was awarded following a rigorous competitive process led by the consultancy arm of the College of Business and Management and the School of Graduate Studies, Research and Entrepreneurship (SGSRE). A special ceremony for the launch of the project and initial stakeholder workshops towards the establishment of the regional procurement training centre was held on Monday, April 18, 2016 at the Technology Innovation Centre (TIC), UTech Papine campus, with stakeholder workshops continuing to Wednesday, April 20. As the selected entity, UTech, Jamaica will first determine the project’s feasibility and based on the results will host and run the regional Procurement Training Centre on a sustainable basis. It will develop curriculum and training materials jointly with BiP Solutions Limited, a consultancy firm specialising in procurement, and CIPS, one of the global leaders in providing procurement learning solutions and qualifications. These organisations will seek feedback from key regional stakeholders to ensure the Centre and its training align with regional needs. Dr. Paul Golding, Dean, College of Business and Management in his remarks asserted that the consultancy project fits into the College’s strategic thrust and into UTech, Jamaica’s mandate to contribute to national and regional development. Noting that some 9-13% of GDP passes through public procurement in developing countries, Dr. Golding said that this raises public concerns related to management and mismanagement of funds, ethical issues and issues of corruption which all increase the need for procurement “to play more of a strategic position, rather than a peripheral one in organizations.” Dr. Golding asserted that the launch of the Procurement Centre at UTech, Ja. is therefore an important step in moving this goal forward. Dean Golding thanked consultancy partners from BiP Solutions and from Chartered Institute of Procurement and Supply (CIPS) and expressed special thanks to the internal cross-functional internal team led by Dr. Carlys Cadogan, Lecturer, COBAM. The team comprises COBAM lectures, Mr. Nigel Cooper Mr. Lloyd Wint, Ms. Carol Barnes and Ms. Yvette Richards; Mrs. Dennise Haldane, Director of Procurement, and Mrs. Genefa Hibbert, Project Coordinator, UTech, Ja. Enhancement Project. Mr. Scott Smith of the Scotland, UK based BiP Solutions in providing a project overview, said his company will partner with UTech, Jamaica to implement the training centre and to deliver the solutions outlined in the terms of reference. He said this will involve a programme for a sustainable model that will be made available to as many people as possible and provide a framework that can lay the foundation for training procurement professionals from across the Caribbean region. Mr. Smith noted that the Foundation Course will be specific to the needs of CARICOM with specific reference to regulations and best practices in the region. Mr. Martin Henry, Manager of Projects and Operations, School of Graduate Studies, Research and Entrepreneurship, who was instrumental in securing the consultancy, affirmed that “UTech, Jamaica was a good choice,” adding that “we intend to deliver on the objectives of the project.” He noted that the Procurement Training Centre while delivering value to Caribbean governments is expected to simplify the complex and cumbersome procurement processes to make it easier for those who participate in it within organizations. Mr. Henry pointed out that the Centre is also expected to be a commercially viable, self-sustaining venture. CDB has committed financing up to USD 137,875 and an estimated additional USD 45,895 in resources, such as staff time, to the project, which will be delivered under the Programme for Improved Public Investment Management through Sustainable Public Procurement Capacity Building in the Caribbean Region. The World Bank has committed USD 320,000 in grant funding.